Keeping your IT ecosystem safe from external threats is a mindset at Leapfrog – we live, breathe, eat, sleep, leap and obsess about cybersecurity. We have to. Because we how hackers all over the world are using increasingly sophisticated, automated tools to breach countless networks every day. You can’t bury your head when you know those facts. You have to take action. With Managed Cybersecurity from Leapfrog, we balance your business objectives and risks with what it costs to protect you against those risks. We use proven, standardized processes and monitor them constantly. Our goal is to keep hackers out, keep data in, and stop any intrusions fast before they can do too much damage. We don’t deploy the same security controls for every bit of data, however — that would slow down your business. Instead, we focus on what’s critical. With certain areas like your financials, human resource and customer information, there are no security compromises. We believe you must do all you can to protect that kind data, even if you’re not required to by law, because 100% of companies will be attacked at some point. The other type of data we believe you must protect is the data that makes your business unique. Your secret sauce is super valuable! Leapfrog works with you to choose the right security standards and apply those standards to your network, infrastructure, computers, devices, apps and data. Then we perform risk assessments to find any gaps, and review the results with you so we can decide together which issues to fix and which to insure. 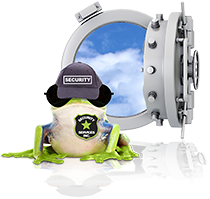 From there our Department of Frogland Security takes over by monitoring, maintaining and reporting on everything. Do you think your company is less of a target because you have fewer than 100 employees? Not so! You could be even more of a target. Many hackers prefer to attack small to medium-sized companies because they’re typically not as well prepared or trained and could be a stepping stone to bigger fish. It was an HVAC company that opened the door to the infamous Target breach. With cybersecurity, one thing is certain — the networks with the least protection are the most vulnerable no matter what their size. With managed cybersecurity from Leapfrog, hackers are much more likely to go elsewhere. Good riddance!